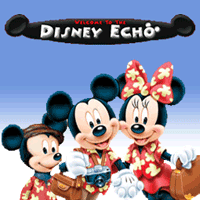 Note: This story is set in a fictional version of Walt Disney World Resort, and all referenced material is used in like fashion. The Walt Disney Company has not authorized or endorsed this story. Confused? Go back to the previous chapter, chapter 1. While Amber was finding out about Oswald’s return—and scoring points by knowing about Oswald in the first place, Johnny has just met him for the first time. It was Oswald’s nose that peeked out to sniff the snacks laid out in the green room, the room Johnny was in, who was sniffing at the newcomer as well. 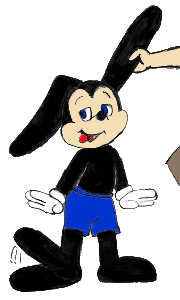 Then the rest of the Lucky Rabbit joined his nose, all two foot ten of him—including his long ears—all black and white save for his blue shorts. Little was added to the long-forgotten character save for the modern eyes. But to Johnny, who’s nose just twitched as he said “Hi there, guess you’re new too,” he was indeed as young and green as he was. Oswald, being older than Mickey of course, didn’t know what to think of that remark. He just humphed. Oswald shrunk a bit, Johnny followed suit. This lead up to a series of Oswald and Johnny trading up sillier and sillier poses, each one trying to out-do the other. Eventually, they both lost their balance and hit the floor at the same time. “Johnny Briz,” Johnny said as he shook his hand. Or rather, Oswald shook his. Johnny blinked, and then tilted his head to see around Oswald. 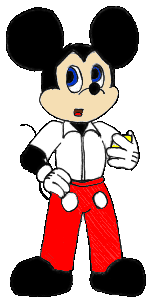 It was Mickey, of course, in the longer version of his red shorts with a collared shirt. It looks like he had his tuxedo on but took part of it off. Johnny could smell smoke coming out of Mickey’s ears. It also looks like he didn’t take the “in his prime” bit too well. Oswald wanted to hear this, especially when Johnny pointed to that band-aid that was on his forehead that the rabbit didn’t notice before. What Mickey was referring to is Oswald, and what he was doing again is making faces behind his younger brother’s back, silently mocking him. 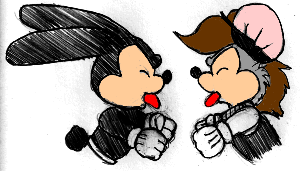 And with perfect timing, Mickey turns around to see Oswald whistling and looking innocent, rocking on his large feet. Mickey couldn’t keep himself from sighing. “Just keep him outta trouble, all right, Amber?” was all Mickey could ask. Oswald only grinned and chuckled as he led Johnny and Amber out the door, while Mickey just stood there and picked at what was left of the snacks. There was a ring from Mickey’s iPhone, he answers it. He then fell silent, whoever was at the other end made him a bit nervous. He flipped the iPhone over, sending it to speakerphone mode. Whoever it was on the other end, he hung up at that point, leaving Mickey to just sigh again. He slid the phone back to his pants and glanced over at the passing Bob Iger. Mickey has a yellow iPhone case! It’s one of his favorite colors.